« We arrived in Hilo!! 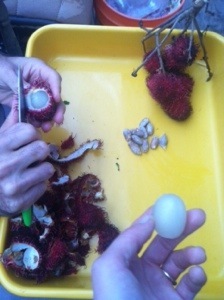 Rambutan is very similar to lychee, longan, and guinep (which Rachel had in Jamaica when she was in the Peace Corps). 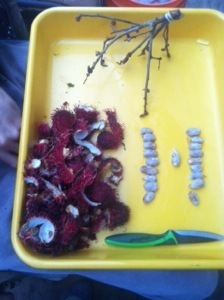 Rambutan is sweet. The fruit is stuck to the entire seed instead of at one point like lychee. The past few days, we have spent cleaning, planting, seeing friends and making new ones, and preparing to build a platform. Our goal is to have a platform 12×48 built by a week from today. Much love and stay tuned! SO good to stay by your sides and watch your progress!! Thanks for keeping us in touch!! Love to you both!! Thanks Margie and Hank!! MUCH, much love to you both! The past two days, we have been moving rock and earth leveling the drive and where the tents are going to go. We need to build a floor for the tents this week, a floor that is 12′ wide by 48′ long! We need to buy those materials and get going. Our stuff will be in Hilo on Thursday of this week and probably get to our property sometime next week. Lots of work / lots of loving to do!